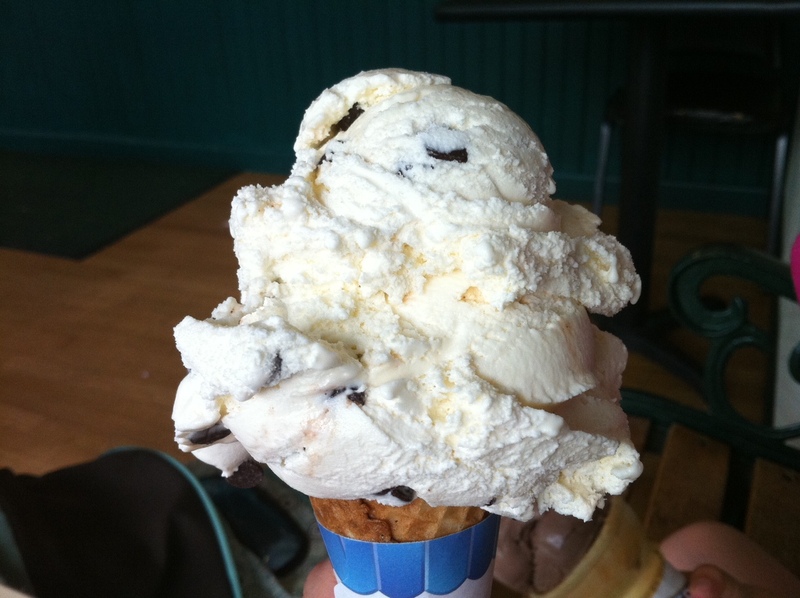 A chocolate chip ice cream cone from Brickley's. Summer hasn’t officially started, but as far as I’m concerned, summer starts the first day that I go to the beach, which happened to be today. We drove to Scarborough Beach to find a nearly empty parking lot and to buy our season parking pass before the rate hike. I don’t think I’ve ever gotten a spot in the first row of the Scarborough lot — apparently that’s what a weekday in early June gets you, along with a bit of wind and icy water. But I still loved it. Of course, where there is a beach, ice cream can’t be far behind, so on our way back, we stopped at Brickley’s Ice Cream for a couple of homemade ice cream cones — chocolate chip for me and chocolate for Madeline. We live in Pennsylvania and are planning a trip up to New England. I’d love to spend a few days to a week near a Rhode Island beach – someplace quiet and beautiful. I have two teenagers who don’t mind hanging out in a quiet place for a few days. I love Napatree Point in Westerly/Watch Hill. So beautiful and not too crowded because you have to walk out onto the point but we’ve been there once before. Any suggestions?